In a non-corrosive saucepan combine the marmalade, horseradish, garlic, parsley, Tabasco sauce, lime or lemon juice, pineapple juice, rum and oil. Season fish with a little olive oil, salt and pepper. Pre-heat cast iron skillet to hot. Pan sear the fish in heavy cast iron skillet about 3 minutes per side, depending upon the thickness. Baste the fish as it cooks with the marinade. Serve the fish with a tablespoon or so of the marinade. Marinate the fish in combined ingredients for 1 1/2 hours. Remove the fish from the marinade and transfer the remaining marinade to a small saucepan and bring it to a simmer. 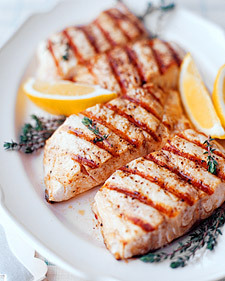 Grill the fish for 3 to 5 minutes per side, depending upon the thickness. Baste the fish as it cooks with the marinade. Done when fish flakes easily with a fork.